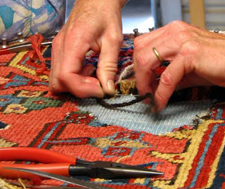 A rug can have many types and forms of repair issues. Color run for example, can lead up to structural damages and rug repair. For every type of problem there is a unique approach and intervention. Color run can be caused by many mishaps and unfortunately it is very common! 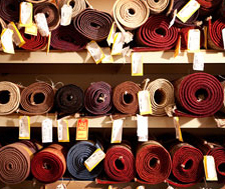 It causes major damage to valuable area rugs and requires the rug experts to fix and repair! If rug repair and restoration was a food chain, fixing a color run would be on the top! The people around the world that can truly fix a color run from a Tabriz or a handmade Silk are probably limited to a hand few! Color run in simple term is when the darker colors of a rug bleeds into the lighter areas and cause damage. This happens when the rug is wet or exposed to moisture. The following are some common causes: The rug was improperly washed and dried and the color run was caused due to this improper cleaning process. This is very common! The rug was exposed to water due to flooding, moisture or other similar mishaps. The pet urine was not removed quickly and properly. The nearby potted plants were overwatered and moisture and water reached the rug. The potted plants placed directly on the rug were not elevated. This cause a temperature difference and condensation build-up directly under the pot. Always elevate your planted pots to allow for air flow. The sub-floor was moist and a proper rug pad was not used. 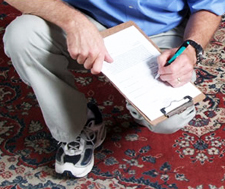 Trust our expertise and experience- We Fix Color Run for the RUG Industry Insiders and Collectors! From Orientals to antique silks and very intricate Persian rugs, We know the origin, wool or silk type, dye and age of each rug in such great detail. 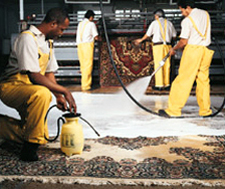 Every rug takes a special and unique process to remove the color run. Too often we receive beautiful rugs for a routine wash and we find it covered with acrylic or similar paint as a mean to mask and fix color run or a stain! An unfortunate discovery that unveils when we wash the rug and residues of dried-up paint separates only to expose the original problem. Sadly, in some cases the chemicals from the paint has already damaged the fibers; caused structural damages and rug requires major repair! A blasphemy! 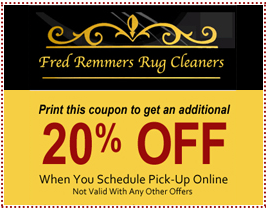 For color run removal and proper rug cleaning, count on the crew here at Fred Remmers. Get in touch with us to get started, or earn a free estimate right here online.